In traditional Japanese confectioneries, you'll often find a curious garnish that is sweet and slightly starchy. It's usually reddish-brown – though not always – and has a surprising range of textures. This is an, an irreplaceable component of innumerable Japanese sweets, both classic and contemporary. "It was probably 12 years ago, before I started living in Japan. I tried an while vacationing in Japan and I was very surprised. In France, we cook beans with salt, not with sugar, so it was strange to me. The texture was also really intriguing," reminisces Chef Manuel. An can be made from an array of different ingredients, such as black sesame, chestnuts or sweet potato, but most commonly from beans. The most typical example is azuki-an, made using red kidney beans (azuki). In many places outside Japan, including France, one doesn't usually imagine beans cooked as a sweet ingredient. It would be akin to mixing cherries with salt! Yet in Japan, there is nothing out of the ordinary about combing pulses (like kidney beans) with sugar. Using this classically Japanese, but not-at-all French ingredient, Chef Manuel challenges himself to come up with a few inventive new breads. There is a popular type of bread in Japan called an-pan that uses an as filling. While it may vary in size, the general premise for any an-pan is more or less the same: dough is wrapped around an and baked. 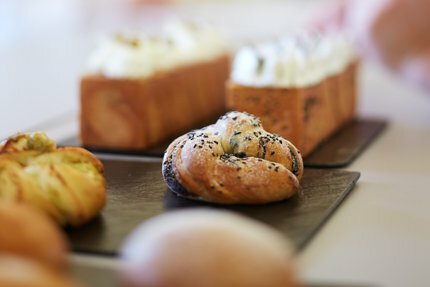 Drawing inspiration from this commonplace baked good and having come to appreciate an as bakery ingredient, Chef Manual goes to work on his new an-inspired creations. "For one type of bread, I tried to adhere to the traditional an-pan shape," explains Chef Manuel, "but I didn't wrap it as it's typically done. By twisting the dough with the an in it, the bean paste will appear as a beautiful helix when the bread is baked and cut into. That's a trick I used." The chef crafted another type of bread, this time combining an with a rather classic French garnish, Chantilly cream. 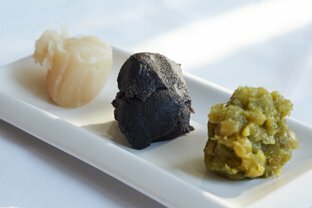 He made two varieties, one with roastedkurogoma-an (black sesame an) and the other with uguisu-an (green bean an). "For [these], I changed the shapes. I gently wrapped the an around the dough and twisted it. This way, you can see an on the surface of the bread as well." Tasting Chef Manuel's reconstructions of an-pan, the most remarkable thing was how well the dough complimented the filling. For French bakery chefs who are accustomed to working with smooth, creamy fillings and garnishes such as ganache or pastry cream, figuring out how to accommodate an's grainy texture can be quite a challenge. 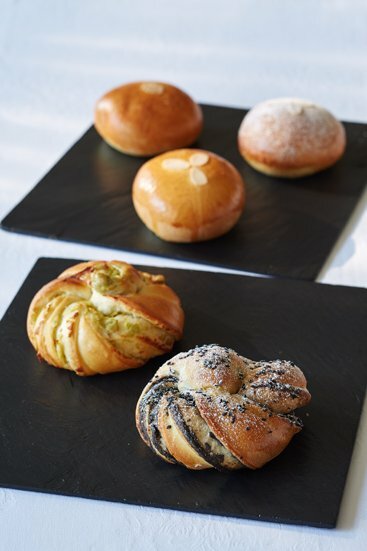 The chef comments on his choice of dough: "The breads I made this time all used brioche-style dough – though maybe a lighter version of the classic brioche. Regardless, the key point that makes this an-bread special is the large amount of butter and sugar. I'm sure an-pan in Japan doesn't have nearly this much butter, but they are necessary to create dough that is both soft and moist. Since my impression of an is that it's somewhat dry, I thought it would work well with this type of dough." While many might consider butter as an indispensable ingredient in bread-making, especially in French bakeries, it is by no means essential in Japanese breads. In fact, Japanese breads often feature little to no butter at all. Despite this seeming clash of baking cultures in Chef Manuel's an-bread, the well thought-out pairing of dough and filling was a match made in heaven! The distinct sweetness and texture of an is complemented by the moist, subtle richness of the adapted brioche dough. Chef Manuel hails from Nantes, a city in the West of France known for preferring breads softer and more buttery than their Île-de-France cousins. Considering this, it's then perhaps not too surprising that he opted for a moist dough like brioche to pair with an. There is no doubt that an will forever remain the quintessential ingredient in Japanese baking. However, its potential as an ingredient in French bakery has been discovered by Chef Manuel, and he doesn't intend to stop there. "We receive samples [of sweets] from a long-standing Japanese confection shop that also happens to produce an. With [Chef] Stephane, I try these [samples] and they really push the boundaries of my imagination. I can't help but think of what else could be possible using these ingredients!"